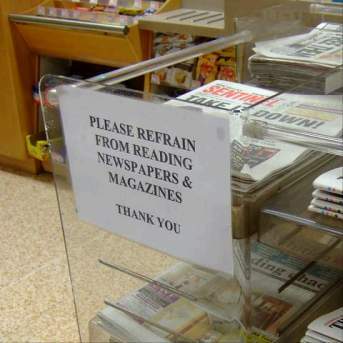 Regular readers of this ageing publication will know that our editor is very fond of certain signs which - in one way or another - give the astonished public advice which it is often best to ignore. This particular classic of the genre was donated by two eagle-eyed readers. Many thanks to both of you. We cannot quite figure out what the owner of this wonderful sign is trying to achieve. If reading papers is forbidden, why go to the bother of trying to sell them all? Have local papers become so dangerous, that they have to have a health warning? Are they perhaps selling papers for use only by interior decorators - in which case why sell more than one reasonably absorbing edition? We hear that certain customers have to hand in their spectacles on entering the shop to make absolutely certain that they obey the rules. These poor people find themselves in a double fix of course, because without their glasses they can't read that wonderful sign! As our readers said: Only in Limavady! 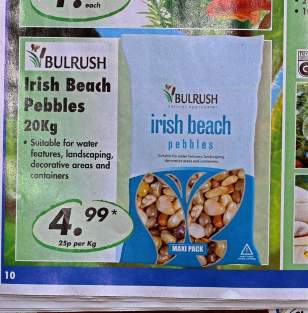 One of the special offers in Lidl's this week is a 20kg bag of Irish beach pebbles for only a fiver! This is very convenient because it saves local shoppers the bother of going down to the closest beach and laboriously gathering the stony harvest themselves. Collecting tons of stones from Irish beaches, flying them halfway across Europe and back again, to sell for a profit at source is obviously one of the economic wonders of the modern world. Has the council finally decided to go straight? 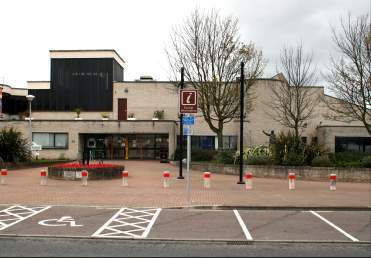 You are looking at the council offices in Limavady. Our reporter noticed that the parking bays, which used to be angled so that one had to reverse against the flow of traffic to park one's car, have suddenly been straightened out. Sharp eyed viewers can still detect the scorched remains of the previous markings. The old way was wonderfully convenient if you had to park your car early in the morning, went to work in - say - the council offices and left around five o'clock during the rush-hour. It was extremely awkward during the rest of the day when drivers had to stop and reverse into the narrow bays against a constant flow of traffic. As most people are not very good at reversing their car, this led to sometimes ludicrous results. The new system will hopefully make life easier for everyone. Could it be that the new strict parking attendants patrolling the town with such obvious enthusiasm had something to do with this change of policy? The recent warm weather has certainly jogged mother nature into producing a welcome flowering. The whin is in full bloom and the blackthorn hedges on Benevenagh are displaying themselves at their best. The best flowering for years!